Increase patient retention while improving your online reputation after care delivery. 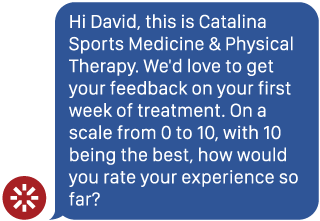 Following their appointment, patients receive a text asking them to rate their experience using the Net Promoter Scale® from 0-10. Patients who respond with a high experience score as determined by your practice will automatically receive links to social media review sites where they can share their positive experience with the public. Dissatisfied patient responses with a score below your preset threshold will be sent in real-time to your management team for follow-up. Visalia Medical Clinic (VMC) discovered many patients only posted to review sites like Google+ when there was dissatisfaction, resulting in an unfairly skewed lower star ranking. Within the first three months of implementing Providertech’s Net Promoter Score technology, VMC did not receive any 1-star Google reviews. And, of the 36 reviews posted during this month time, 35 were five-star ratings. This extraordinary shift in positive online feedback increased VMC’s Google rating from 2.6 stars to 4.5 stars in just 120 days. Two-Way Messaging: Our SMS text-based messaging allows you to send automatic messages after care. Patients can quickly respond about their experiences with numerical values from 0 to 10. Automatic Promotion: Patients responding with predetermined high scores like a 9 or 10 will automatically push promoters to reputation sites where they can leave positive feedback. Real-Time Service Recovery Alerts: Patient scores below your predetermined threshold such as 5 or 6 will be sent to your management or service recovery team for immediate follow-up. Text Analytics Processing: Our text analytics processing engine detects quantitative scores versus text-based feedback to understand intent. Trend Analytics: View keyword trends and aggregate Net Promoter Scale score by provider and office for actionable insight.